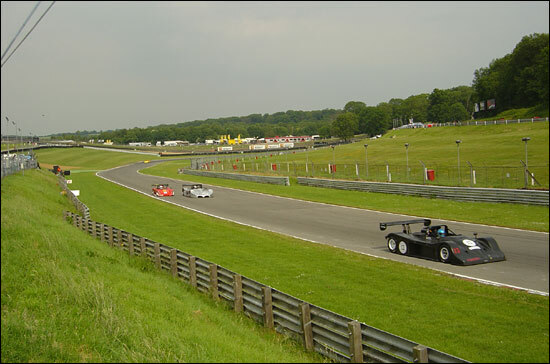 The Britsports races, as ever, entertained the crowds at Brands Hatch last Saturday and Sunday, (17-18 June) on one of the warmest weekends this year. The planned 45-minute Race one, on Saturday, had seen victory for lone driver Howard Spooner, in a welcome return to the podium for the Jade marque, after a red flag brought proceedings to a halt, and the results declared after just 26 minutes, with 16 laps on the board - Ben Devlin having gone off heavily at Hawthorns in the Juno SS3. Pit stop timing, and luck, had been crucial in this truncated race – Nigel Greensall had relieved Dave Shelton early in the first-time-out Yamitsu, and was well placed in second when the reds came out, whilst erstwhile leader Dave Mountain had only just handed the Juno SS3 to Clint Bardwell, who was about to mount a climb-back from seventh position. Fortune smiled upon Richard and Nicola Bernans, classified second, and yet to make a stop, in their Radical SR3. Unfortunately owing to problems for a number of teams on Saturday, only fifteen of the twenty-one cars entered for Sunday’s sixty minute race were able to make the grid. Race one winner Howard Spooner had elected not to do the slightly longer Sunday race, and so didn’t take his pole position, leaving the front row clear for Shelton and Greensall. After a good start Shelton was caught and passed by Michael Christopher in the Rapier, and Judd Copeland running a V6 Juno. Lap six saw Copeland pass Christopher and pull away for an early lead. However the most impressive drive was that of Jeff Davies, who had come from fifteenth on the grid in a Juno SS3 to third by lap four. Lap 10 saw Copeland involved in an incident at Druids whilst passing a backmarker, leaving him in the gravel trap handing the lead to Davies: Copeland trailed by four seconds, before retiring to the pit lane for seven laps, taking him and second driver Robert Oldershaw out of the running for a race win. Lap 11 brought the first of the pit stops from the front runners when Dave Shelton handed the Yamitsu over to Nigel Greensall, who immediately started punching in a series of fastest laps. 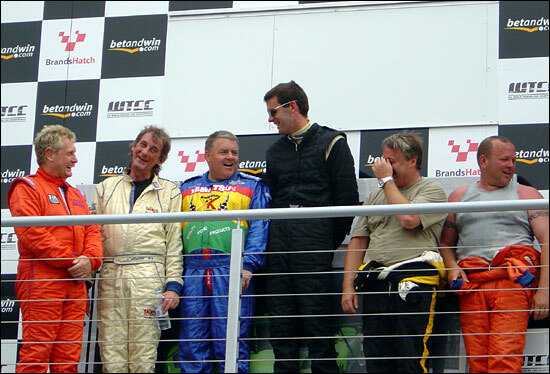 Michael Christopher handed the Rapier to Ian Flux on lap eighteen, who, like Greensall started setting consistently quick lap times. After a fantastic drive from Jeff Davies, he handed the Juno over to Neil Briggs on lap nineteen, Briggs rejoining in third place, following a smooth pit stop, behind new leader Chris Bardwell, also in a Juno. However Flux and Greensall, now fourth and fifth respectively, were catching all the cars ahead and lap 27 saw Greensall pass Flux for second, both having already passed Sam Alpass in a Juno. Greensall soon caught and passed new leader Tony Freeman, in the supercharged Radical Prosport, for the lead, and Flux followed him through, but was not able to mount any sort of challenge for the race win against the seemingly unbeatable package of Nigel Greensall and the stunning home built Mugen V8 Yamitsu. Dave Mountain passed Neil Briggs for third, with Adrian Mardlin and Tony Freeman coming home fifth and sixth. Greensall commented afterwards: “The car ran really well all weekend, we had some problems with tyres on Saturday which worried us a little, but everything ran fine in race two today. It is such a good car. Bearing in mind it is its first race since it was built in 2000, to take home a win and a second place is great news. The main thing is that such a small team has done such a fantastic job putting together a race car which can out perform other cars which have been under constant development for years. 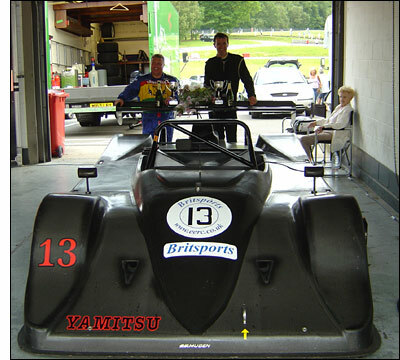 Built entirely by a small team which has clearly paid great attention to detail, the stunning Yamitsu must surely be run again. A pleasure to watch on the track and a pleasure to look at, it would be doing motorsport a great disservice to see it boxed and put away.